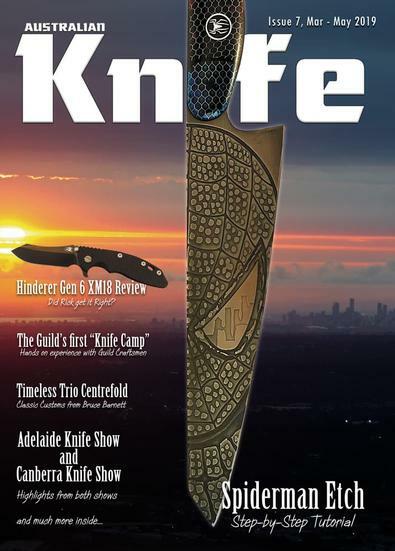 Australian Knife Magazine is for everyone who appreciates a well made knife. We aim to cater to makers (aspiring and established), collectors and users of every variety. We bring to you news, reviews, tips and tricks, collectors' insight from Australia and around the world. We keep you informed of latest trends in both custom and factory made edged tools with focus on high quality, detailed photos. The only publication of its type in Australia! A locally focussed magazine, with well written technical articles as well as the show pieces from some of the great makers in Australia. This magazine fills a void that has existed for a while. Friends gave my husband the first edition of this mag and he loves it. Informative, interesting, beautifully set out and inexpensive. Am certainly subscibing to Australian Knife Magazine so he doesn&apos;t miss any issues.